The Roshni app has been developed by IIT Ropar and is currently available in beta on the Google Play Store. The app helps recognise old as well as new currency notes. The Roshni app is available on Android. It is in an unreleased state. The app helps recognise currency notes. The Indian Institute of Technology (IIT), Ropar, has developed an app to help the visually impaired recognise currency notes. The app can recognise both old and new notes and gives audio information as to which note you are holding in your hands. The application is called Roshni and is free on the Google Play Store. The team comprising of Dr Puneet Goyal, PhD scholars Mandhatya Singh and Joohi Chauhan, and student R Ram from the institute demonstrated the app. The demonstration took place in the presence of students from Institute for Visually Impaired, Chandigarh. 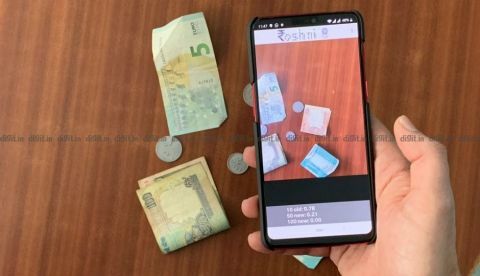 The claim is that Roshni is the first Android app to successfully recognise new INR currency notes. The new currency notes came into effect after demonitization. We now have Rs 2,000 notes while the old Rs 10, Rs 50, Rs 100, Rs 200 and Rs 500 got a refresh. Speaking of the app Dr Goyal said, “This App utilises an adaptable deep learning framework, which further uses the patterns and features embedded on the notes to differentiate and determine the currency denomination. 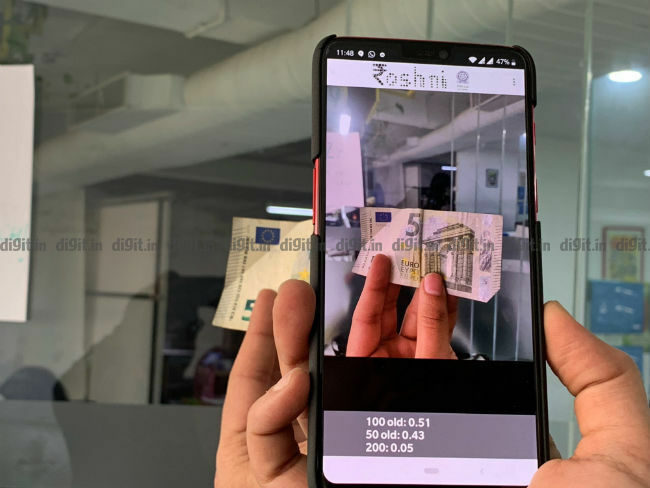 Our IPSA (Image processing, Security and Analytics) lab prepared a rich dataset of more than 13, 000 images of currency notes under varied real-world conditions. 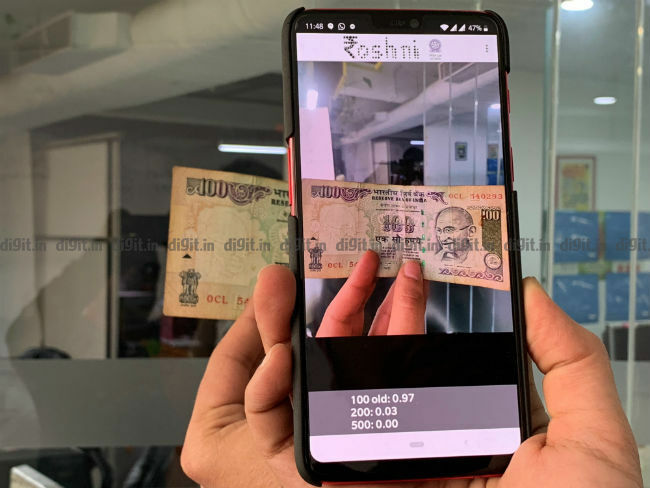 The user has to bring the currency note in front of phone camera and the App would provide audio notification intimating the currency note denomination to the user." We downloaded the app on two smartphones, the Pixel 3 and the OnePlus 6. The app was extremely buggy on the Pixel 3 and wasn't perfect on the OnePlus 6 either. But remember, the app is still in the unreleased state on the Play Store. We spent a precious few moments with the app to see how it runs. Fire up the app and you need to give camera access to the app. Once the access is granted there are no navigation buttons which makes sense. The app greets you with a 'Welcome' audio cue and keeps saying try again if you don’t present a note in front of the rear camera. We used an old Rs 10 note, a new Rs 50 note, an old Rs 100 note and a 5 Euro note so see how the app works. 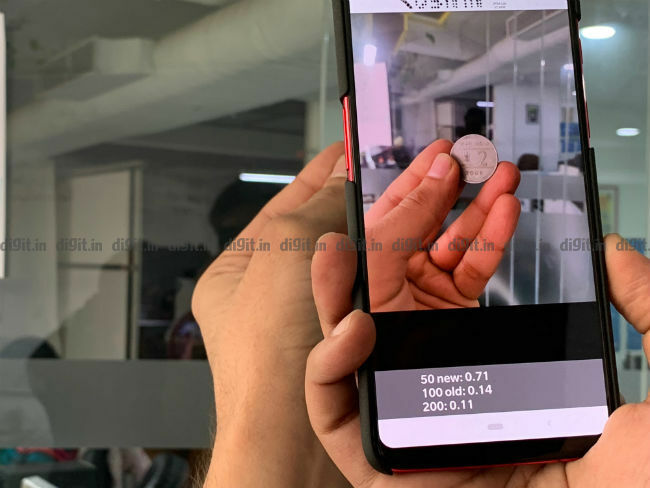 It recognised the Indian currency perfectly when the currency note was held in full view of the rear camera. However, fold the note and the app took some time to recognise it. We tried to complicate the situation by holding the note at different angles, both folded and open, and there were times when the camera recognised the note perfectly and others where it asked us to try again. The good thing is that it didn't recognise a note wrong. It asked to try again but didn't get the indian currency wrong which is good. When two notes are placed together, it recognises only one of them. This means that the app can only recognise one note at a time. We placed a 5 Euro note in front of the camera and it recognised it as a Rs 100 note sometimes. So the app isn’t equipped to recognise foreign currency and can confuse some foreign currency as Indian. We even tried opening images of currency notes on the computer screen and the app recognised those as well. We tried placing Rs 10, Rs 2 and Rs 1 coins in front of the app and the app didn’t recognise them which is disapointing. It would be nice to see the app recognise coins as well. There are settings as well in the app to change the language to Hindi, but this didn’t work. There are also settings to adjust the time gap between response time, along with the ability to adjust the probability after which the currency value should be spoken. Overall, yes the app is buggy but it is available in an unreleased state. Hopefully the final version will be bug free and we hope it can also recognize coins. If you are one that is interested in checking out the app, you can do so here.